I have blogged twice before about assessment in the new national curriculum (here and here) and looking back at those two posts now it seems high time for an update. We’ve moved on quite some way and we are now implementing our assessment without levels system (or AWOL, as our Head of Science seems intent on calling it) across the school. What we know, then, is that roughly the same proportion of students as currently achieve grades A*-C in existing GCSEs will achieve grades 9-4 in the new GCSEs, but that the threshold standard is being raised to grade 5 against international benchmarks. But we still don’t know what students will have to know or be able to do for that grade 5 in any given subject, nor are we likely to as the boundaries will shift year on year, especially in the infancy of the qualifications I suspect. We need to aim higher if we are to get as many students as possible to grade 5 and above – it will be tougher than C and above. Linking our assessment system to GCSE grades (as was our original plan) is not going to work. Both Shaun Allison and Dan Brinton have been instrumental in clarifying my thinking about the threshold model of assessment. I highly recommend you read Shaun’s Assessment without levels – an opportunity for growth and Dan’s Designing a new post-levels curriculum and assessment model from scratch as they are both superb and you will see that a lot of the ideas in this post are not, in fact, mine, but theirs! Essentially, in a threshold model, you set up your curriculum with an expectation in terms of content and skills within each unit, year, or key stage – the “threshold”. At each point, you assess students to see the extent to which they have met, exceeded or fallen short of this threshold. The model has the advantage of letting teachers decide the expectations (thus allowing challenge to be built-in) and providing ready-made opportunities for formative assessment and feedback in relation to the threshold expectations. As implied by the title of Shaun’s blogpost, it’s also a system that is compatible with our growth mindset ethos – more of which later. What to call the threshold? However, we couldn’t quite agree on language that would fit different subjects appropriately. 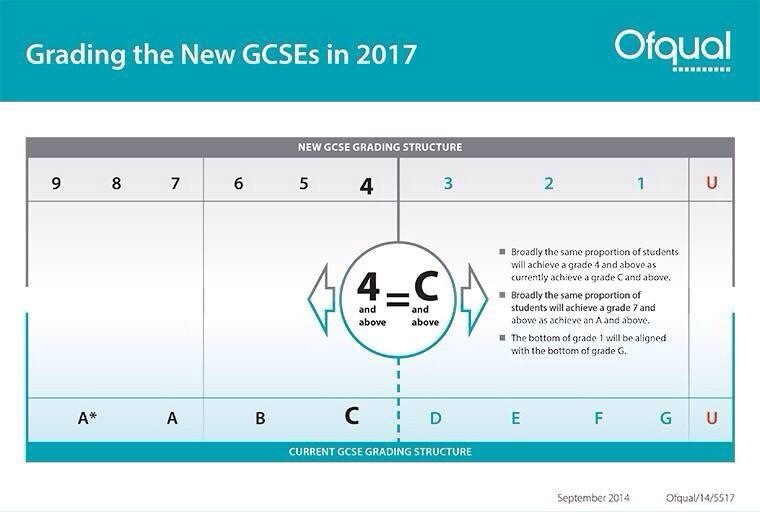 We considered with the idea of using new GCSE grades 1-9, but they sounded too like the old levels and, in any case, we would have to guess at the standard they represent which is not a sound basis for a new assessment system. In other words, if a student can demonstrate they have met the demands of the Year 8 curriculum by the end of Year 7, they would be graded as B in Year 7. An A* student in Year 7 would be demonstrating the knowledge, skills and processes required of a Key Stage 4 student who had met the C grade threshold. In our system, for students to have achieved the threshold on entry to the school, they will have to demonstrate that they have met the requirements of the Key Stage 2 National Curriculum in each subject. In time, we will receive this information (at least for English and Maths) from the new Key Stage 2 assessments, but this will not happen until 2016. Therefore we will baseline all students (as we do currently) to assess the extent to which they have met those requirements at the start of Year 7. Any gaps or shortfall will need to be addressed early. The threshold standard in each year will be decided by the teaching teams within school. It will be informed – but not limited – by the relevant national curriculum requirements, of course, but the guiding principle is that if we are going to value what we assess then we must assess what we value. Therefore the new curriculum that is being designed is based on the key ideas, concepts, knowledge and skills within each subject, informed by the national curriculum, but decided by teachers. At Key Stage 4 the curriculum will, of course, incorporate the examined elements of the KS4 programme of study or examination specification but will not be limited by that. Our best students go beyond and around the specifications anyway – and so should we. If we are going to prepare our students to do well at GCSE we should be teaching them beyond GCSE in Year 11, so the terminal exams they sit seem like a walk in the park in comparison to what they have been doing in the classroom. We already use a flight paths model to track progress in all subjects. Within the new system, tracking progress is even easier. In the example above, a student is assessed at C on baseline and maintains that performance through Year 7 and 8 (the green highlighting). We should expect all students to maintain their performance through the curriculum, but challenge them to improve it. 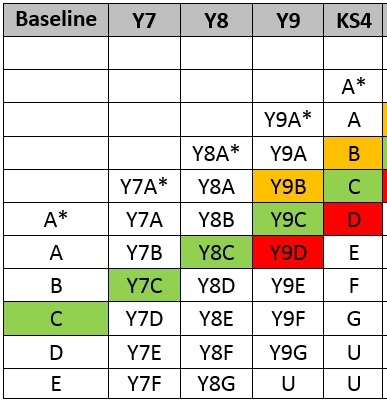 In Year 9, the table above illustrates what happens if a students improves their performance (the orange highlighting), leading to better than expected GCSE outcomes, and what happens if they do not make progress through the year (the red highlighting), leading to an under-performance at GCSE. At this stage it’s important to be clear about the expectations of this system. No matter where students are on their baseline assessment, it is the job of the curriculum to ensure that as many of them as possible end up above the threshold by the end of each unit, year, or key stage. If a student is a D or an E at the baseline, that is not an excuse to stay on a D or E for the whole of their school career. Rather, it is a challenge to the teacher and the curriculum to fill in the gaps from the previous year as well as teaching the content, skills and processes of the current year. This is the gap that must be closed. One important element of this system is the introduction of a terminal assessment in each year of the curriculum. This assessment will be in the same style as the GCSE assessment in the relevant subject, and should assess the knowledge, skills and processes of the entire year’s curriculum. Students will have to revise for it, thus preparing them earlier for the demands of the two-year linear assessments in Year 11. We also intend that this approach will improve retention and recall, as curriculum design will be interleaved to incorporate regular revisiting of the key knowledge, skills and processes. Finally, this model moves away from giving each student a target to aim for based on FFT D, CATs predictors, teacher assessment plus some magic dust and a following wind (as described in this early post on my blog – see, David Didau doesn’t have the monopoly on changing his mind!). When I launched our growth mindset ethos, one of the first responses I had was our Head of Geography asking if this was the end of Challenge Grades (our term for student targets). If potential is unknowable, why are we selecting an arbitrary grade and pretending to know it? She was (and is) right, of course. So we will now be judging progress based on where students start and how far they’ve come from that known point, rather than how far they’ve got to go to a point which we cannot and should not pretend to know. Faculties are meeting on Monday to begin the process of deciding the threshold standard for each year within the curriculum. Some are already there, having piloted systems through last academic year. Others will need to move this year. We need to finalise what reports to parents will look like in the new system – we have a draft, but it needs thinking through. 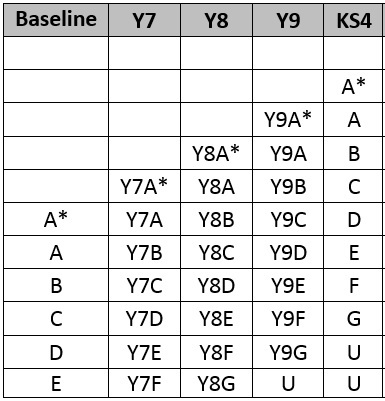 We need to troubleshoot the progress measures – if a student moves up a grade in Year 8, does the higher grade become their new baseline or do we continue to measure progress from the start of Year 7 baseline point? What if they drop a grade? We need to decide when we move over from the legacy system to the new. We only get one chance to get this right – so we need to be sure we have it sorted. These are the practicalities – but the principles I am certain are right and the system I am sure is workable. I’ll keep you posted! You may like to explore this posting which asks is it possible to assess without using grades or levels. Thanks for the tip – that was new to me and very interesting reading. Lots in common with our approach; though we are labelling out thresholds with letter grades the concept of threshold assessment is, I’m sure, the way to go. No problem. Let me know if I can help in any way. As you say it is important to get it right. – How do you figure out what children know ‘beyond’ the confines of the curriculum, e.g. the science that is being done at the moment, we know all about already, and in fact far beyond it from reading done at home (the teacher won’t necessarily be aware of this in lessons). How do you ensure that a child’s assessed level is accurate, if the test only tests what has been covered in class/the NC requirements and not the higher level stuff that they might know as well from learning done outside school? – Does the yearly terminal exam model carry along with it some of the dangers of the terminal exam at GCSE? (e.g. not necessarily demonstrating what a child knows, if they are not particularly great at doing timed exams, or if they have a ‘bad day’, suffer from hay fever, etc. etc.)? The baseline is different in each subject. In some subjects it’s a holistic assessment of all the first term’s work. In others it’s based more firmly on a specific test (or tests) which the students sit. We’re definitely not about high pressure assessments in the first term of secondary! Your second question is a million-dollar question and the unfortunate answer is that we don’t always get this accurately from the assessments done in school. What we do is assess the curriculum we deliver to see to what extent the students have grasped, understood and retained what they’ve been taught. As you might expect, it’s very difficult for us to assess the stuff they also know which we haven’t taught them! Over time, however, this will come to bear as students make connections between aspects of the curriculum and their wider knowledge. Another point I would make is that most teaching of “new” concepts or topics will begin with establishing the prior knowledge of students in order to pitch the lessons effectively. This is a normal approach to teaching and learning and I would hope that this would pick up a student who was already familiar with the material and needed stretch and challenge. Finally, the terminal exam is a high-stakes assessment but it isn’t an all-or-nothing assessment. The end-of-year assessment will be informed by the examination result, but in most subjects the student’s wider attainment would be taken into account. If, as you suggest, a student had a bad day in their Year 8 exam, the teacher would already have a wealth of in-class assessment to measure that exam against and arrive at a fair assessment of the student’s knowledge overall. Pingback: The Secret Diary of a Teenage Brain – my #TLT14 session in blog form | What do I stand for? I am incredibly interested in this idea of thresholds as it seems the best way of making the new system actually workable! In addition to the fine work that has been done through the blog entries listed here, is there likely to be an Ofqual/Gov/Whoever ‘suggested approach’ to implementing the new grade systems? My fear is that it’s very quiet at the moment regarding direction and implementation advice and as soon as a system comes along that ‘they’ like THAT system will be rolled out, regardless of however other institutions have interpreted the changes. Being proactive is clearly more beneficial regarding preparation, but it all gets nullified when someone provides more ‘clarity’. I, not for the first time admittedly, feel very ill at ease with the distinct lack of information being supplied to help support these changes and give education establishments the opportunity to at least attempt to deal with yet another change. Who loses most in the process? The students. Again. I would really love to hear more about progress being made on this at other schools as my own is very much in the infancy of implementing changes. I would dearly love for us to get it right and avoid pitfalls so any information is greatly appreciated! Hi – thanks for the comment! I genuinely believe that the DfE will not be rolling out a “preferred” model of assessment. They have said as much and all the evidence so far has supported that, both from the Department and also from Ofsted. They have published a set of assessment principles (here: https://www.gov.uk/government/publications/assessment-principles-school-curriculum) and they have provided some guidance via the Beyond Levels project through Teaching Schools (here: https://www.gov.uk/government/publications/beyond-levels-alternative-assessment-approaches-developed-by-teaching-schools). Both of these are useful frameworks. Then there are the Assessment Innovation Fund schools (see here: https://www.gov.uk/government/news/schools-win-funds-to-develop-and-share-new-ways-of-assessing-pupils) which have been funded to develop alternative assessment approaches, but carefully without one preferred model. There is a Thresholds Model there, though, developed by Durrington High School, which is the model that we are adopting. I for one welcome the lack of central control and the freedom to innovate and develop a system that is fit for our context, curriculum and clientele – no more one-size-fits-all and much the better for it! Thanks for this Chris, more useful resources to help me get my head around it all. I agree with you whole-heartedly about freedoms. I just hope the lack of central control early on and an understanding of contexts is not a disadvantage when it comes to the floor level targets, which IMO are more important to link to the context of a school/area etc.